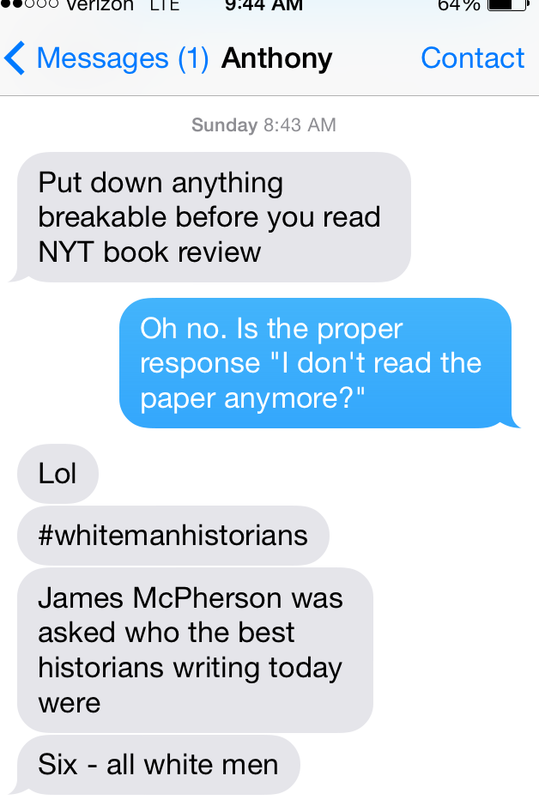 Catching up with the #Historiannchallenge – Monica L. Mercado, Ph.D.
Over fall break I had a chance to catch up with my blog reading and found Historiann’s responses to James McPherson’s interview in the October 5 Sunday Book Review (or, what my graduate school BFF called #whitemanhistorians). Historiann came up with a better hashtag, and the makings of a project: the #Historiannchallenge. In “Historiann: The New York Times Book Review Interview,” Ann invited wider participation, and a recent follow up proves lots of us were happy to oblige. The hashtag is still going strong, and now I’m inspired to power through my growing book piles. Here’s my interview, where I surprise myself with just how Catholic it is, and surprise no one with how many women are represented. Now if you asked me what books are currently on my desk…we’d be here all night. Truly great and truly unexpected — even for someone who wrote a dissertation on American Catholic history — was Emma Anderson’s The Death and Afterlife of the North American Martyrs. I read it about a year ago for the Seminar in American Religion at Notre Dame’s Cushwa Center, and was stunned by the book’s scope and Anderson’s compelling prose (on a subject I previously had little interest in — saints and martyrs). I’d love to teach it in a public history course. In my postdoc at Bryn Mawr’s Greenfield Digital Center for the History of Women’s Education, I’ve been spending a lot of time thinking about social media, blogging, and other kinds of writing in public. So when I think about “writing today,” I think about the bloggers I’ve been reading since graduate school: Ann, and Claire Potter, who have always set the bar pretty high for the rest of us in terms of both content and building a conversation. I’ve read everything Jill Lepore writes, beginning with The Name of War. Her recent New Yorker piece, “The Last Amazon,” has me counting the days until The Secret History of Wonder Woman comes out next week. So have I mentioned I don’t really believe in “the best,” because really, how is this a question? Next semester I’m teaching the history of women’s higher education (a course that I first co-taught at UChicago in 2009), and I’m slowly working my way through Helen Lefkowitz Horowitz’s biography of Bryn Mawr’s second president. The Power and Passion of M. Carey Thomas is a pretty juicy read; we’re hoping to work on a grant next year to get a portion of Thomas’s correspondence with Mary Garrett digitized. Garrett’s biography will be on my list after I finish with Thomas. I’m also planning to get to Rachel Hope Cleeves’ Charity and Sylvia sooner rather than later. Having just returned from the Oral History Association annual meeting in Madison, Wisconsin, I have to mention Allan Berube’s Coming Out Under Fire: The History of Gay Men and Women in World War II. It’s a book that my students have loved (in addition to the edited collection of Berube’s writings, My Desire for History) — that rare “classic” that still merits reading (and teaching). Best, schmest: I could never pick just one. I always go back to David Blight’s Race and Reunion: The Civil War in American Memory, given how much of my work has to do with sites of history and memory. Evelyn Brooks Higginbotham’s Righteous Discontent: The Women’s Movement in the Black Baptist Church, 1880-1920 remains an important model for me as I think about women, religion, and respectability. I’m incredibly excited to get my hands on Allyson Hobbs’ A Chosen Exile: A History of Racial Passing in American Life. It’s been exciting to see my fellow UChicago-trained historians publish their first books in the last few years — Sarah Potter’s Everybody Else: Adoption and the Politics of Domestic Diversity in Postwar America and Ellen Wu’s The Color of Success: Asian Americans and the Origins of the Model Minority also come to mind. What can I say, you can take the historian out of Chicago but you can’t take the Chicago out of the historian. I’ve only been teaching for five years, but I was intrigued to find that one of the first monographs I taught, Beth Bailey’s From Front Porch to Back Seat: Courtship in Twentieth Century America was a favorite of my women’s history students in 2009, but completely dismissed by my history of sexuality students in 2014. Does anyone have a suggestion for another text on courtship and dating? My favorite books from childhood are, not surprisingly, centered on strong female protagonists: the Little House series, Pippi Longstocking, Harriet the Spy, The Mixed-Up Files of Mrs. Basil E. Frankenweiler, Tiger Eyes, Little Women. I’m starting to feel like such a cliche. I was just talking to my mother about a children’s book on Eleanor Roosevelt that I loved. It had these crazy, cartoony pictures (I still remember Eleanor illustrated wearing big orthopedic shoes) and covered a larger theme about understanding children with disabilities. Does this ring any bells for anyone else? Maybe I’ll contact the FDR Museum and Library! 11th grade “World Literature” at Albany High used to require a major research paper. We were asked to write down our top three topic “contenders” on an index card. I can’t remember what I wrote down for #2 (or how I came to this shortlist), but I chose Kafka’s The Metamorphosis as #1 and Chopin’s The Awakening as #3. I still remember the moment when the teacher told me to ditch Kafka; she thought I’d enjoy Chopin so much more. Apparently the story of my life is not realizing how much I love women’s stories. That paper required outside research, and I found myself deep in the stacks of my local university library. I wrote twenty pages about biology as destiny (good grief, 1996…) and here we are. Literary, eh? I guess you can’t hang out with historians all of the time. I was really looking forward to Meg Wolitzer‘s The Interestings — her novel The Wife is one of my favorite novels of all time, and who doesn’t like summer camp? I considered putting it down without finishing, but instead pushed through, underwhelmed. I needed good fiction to get me through the end of writing my dissertation, and this was a disappointment. I probably shouldn’t admit this, but I never finished Kathleen Brown’s Good Wives, Nasty Wenches, and Anxious Patriarchs: Gender, Race, and Power in Colonial Virginia during exam cramming. When The Junto chose it as their Summer Book Club pick this year, I remembered my mistake. Many, many people (including my advisor) recommended Anne Lamott’s Bird by Bird when I felt really crippled with doubt and writer’s block during the dissertation writing process. I bought it, but could never bear to crack it open. So it languishes on my shelf to this day. My ILL copy of Challenged by Coeducation: Women’s Colleges Since the 1960s is due Thursday, so there’s that, along with a bunch of other books to skim for my Spring syllabus. My new Philadelphia Catholic studies reading group is tackling Tim Matovina’s Latino Catholicism: Transformation in America’s Largest Church for November. I’m also realizing how little I read outside of the U.S. context. When I was in Chicago last week, I had the opportunity to hear UChicago historian and new MacArthur Fellow Tara Zahra speak about her research, and it convinced me I really need to read The Lost Children: Reconstructing Europe’s Families After World War II. And last, but not least, I’m curious about Lena Dunham’s Not That Kind of Girl and Roxane Gay’s Bad Feminist. Both are on my list as a result of Gay’s pretty rave review of the Dunham collection, and because I think I’ll need something lighter if I actually finish Gilead & co. But don’t just listen to me: check out the growing list of #Historiannchallenge responses on Twitter. Thanks for the challenge, Ann!